Dr. Georgios Makris, a postdoctoral scholar at the University of Missouri Research Reactor (MURR) knew that in order to enhance his research skills toward becoming an stronger independent researcher that taking advantage of the opportunity to live temporarily in the United States would allow him to further his research interest. It would also present him a unique opportunity to continue the legacy of MU research excellence that he inherited from his advisor, Dr. Heather Hennkens. With a research interest in early stage development of radiopharmaceuticals for diagnostic imaging and targeted therapy of cancer, today he is doing just that with a long-term goal of translating his designs into human clinics. Dr. Makris came to MU after meeting his advisor, Dr. Hennkens in Greece whom he also credits for receiving the approval to create a two-year postdoctoral position, for which he applied and was selected in 2016. Notably, his doctoral advisor in Greece, Dr. Dionysia Papagiannopoulou, is also a past MU Postdoctoral Fellow at the Department of Chemistry. To date, Dr. Makris has been involved in multiple research projects, while interacting and networking with top scientists in the field of radiopharmaceuticals, through internal and external collaboration. “Currently, I am preparing multiple manuscripts for publication in high impact factor scientific journals and presenting our exciting outcomes at national scientific meetings” say Makris. 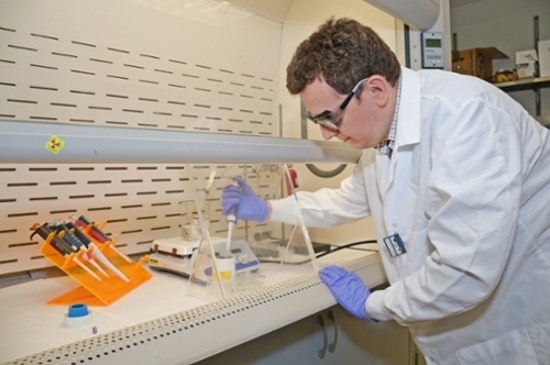 In addition, two of his last first-author research works have been selected for oral presentations at the upcoming 255th American Chemical Society National Meeting & Exposition being held in New Orleans. In the future Dr. Makris hopes to continue the legacy of research excellence by returning to Greece after accepting a position as a radiopharmaceutical scientist for ΒΙΟΚΟΣΜΟΣ, a company in his native country that specializes in radiopharmaceutical production for clinical applications in Nuclear Medicine. Makris shares that this opportunity will give him the chance to further grow professionally and be involved in radiopharmaceutical manufacturing operations. And we wish him the very best as he continues the legacy of MU research excellence.